I know it’s February and miserable (so does my skin and my hair ugh) but I promise you, spring is ON the horizon people. Have you taken a peek at the stores lately? They’re gearing up with all kinds of cute clothes and bless their hearts, colour. So far I’ve seen lots of sunny yellow, cheerful honeysuckle, baby blue, and rich vibrant jewel tones (usually saved for the fall and winter). Anyway, I’m contemplating my spring coat purchase, and these are a few of my picks. Hope you adore! Kenneth Cole Dot Print Asymmetric Coat – $181 @Nordstrom – Between the fab houndstooth-esque print, the mod black and white colour scheme, and the classic double-breasted neckline, there is muchos to love about this versatile coat. BCBGeneration Funnel Collar Belted Trench Coat – $227 @ Macy’s – The apple green colour of this coat simply screams spring, while the modern updates like a fun broad collar and asymmetric zip make for a chic statement. Lauren Ralph Lauren Modern Trench Coat – $195 @ Hudson’s Bay – Although trenches typically hit around the mid-thigh, newer designs favour a shorter length. I love the sunny lemon yellow of this classically-inspired coat. Coat With Ruffled Hem – $199 @ Zara – The unique, feminine details on this coat prove that black can be anything but basic. From a sleek collarless neckline to a sweet girly ruffled hem to a fun belt, this jacket adds a little European style to any gal’s wardrobe. So how about it ladies? 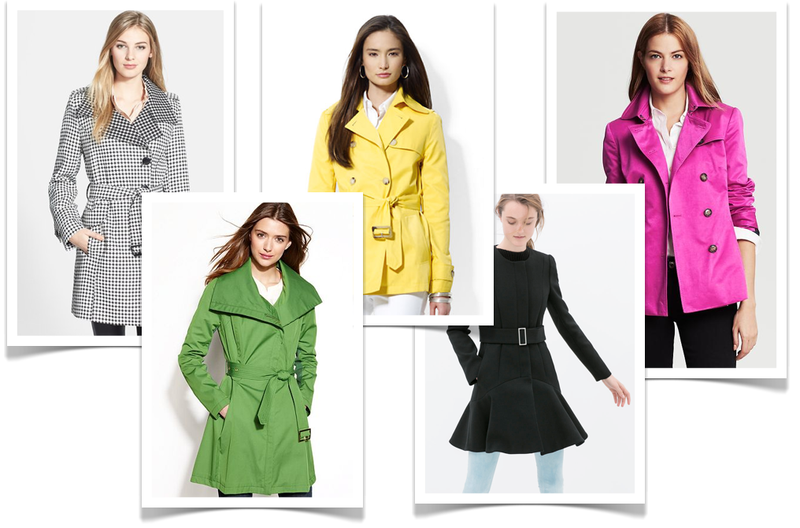 Which of these lovely coats would you most love to sport this spring? Tell me in the comments below to rack up another entry into my Shop For Jayu giveaway. I love Banana Republic’s Pink Short Trench. The Pink Short Trench really caught my eye. I love the Banana Republic Pink Trench. Not sure I could wear that colour, but Wow!! I like the Kenneth Cole version – think it’s a classic look that would last a long time. I love the Pink Short Trench! I will give a hint to hubby! I love the Pink Short Trench from Banana Republic. Shop For Jayu bonus giveaway: I do like the “Coat With Ruffled Hem” but the sleeves look so tight to wear anything under it, so instead I’ll pick the “Pink Short Trench”. Thanks. I like the coat with ruffled hem by Zara.